Look at this Cat!! It glows in the dark!! 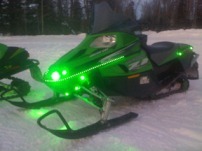 These customer photos show the Brite Lites LED strips and round Accent modules on a new Arctic Cat snowmobile. With a little creativity and some effort, you too can transform your vehicle into a head turning one of a kind machine. Coming or going you can't miss this CAT! 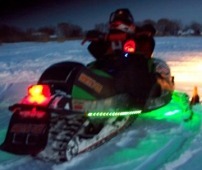 This sled has 2 of our 36" LED accent strips (p/n BL-ASLEDG @$39.95ea) and 2 of our 8 piece round Accent Lite Kits (p/n BL-ACLEDG @ $39.95ea) giving 16 round LED modules and 6 feet of LED strips for a total cost of $160. 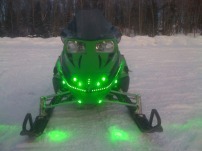 Green glow from front to back! Looking at the back and still GREEN!